This story illustrates the death of the word, retouching. No longer do retouchers retouch photos. Now, folks Photoshop images. Photoshop is both a verb and a noun. In its context as a verb, its a bad word. A few weeks ago, in testimony, I had to explain that I hadn't "Photoshopped" the video being displayed. The times, they do change. There have been numerous studies that show improvements in street lighting are more effective at deterring crime than CCTV. Here's a little more fuel for that fire. 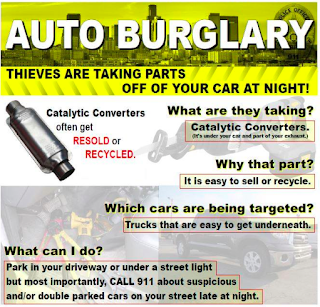 Auto parts theft is a massive problem in big cities. 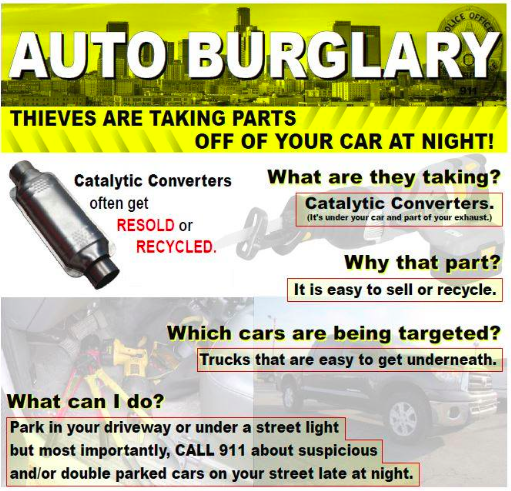 Thieves take parts that are easy to get to and will sell quickly. But notice the recommendation from the poster. Nowhere does it say to install CCTV. It says park under a light and to watch out for suspicious activities. Here's an outstanding article on setting up and running virtual machines. "Most of the time, one operating system per computer is enough. But on occasion, you might want to boot up a second operating system for security reasons, testing purposes, or compatibility with specific software. Technical details typically restrict that alternate OS to a single PC, however. You can only install an OS in a single location after all. But using a fork of Oracle's popular VirtualBox virtualization software, known as Portable VirtualBox, you don't have to limit secondary operating systems to a single computer or boot it up separately from Windows. Instead, you can pack it onto a portable USB drive and load it up on any PC while Windows runs in the background, like a virtualized version of the Windows to Go option found in Windows 8 Enterprise. Portable VirtualBox is fairly easy to set up, though it does require attention to a few key details. We'll walk you through it, and outline some of the main concerns with running a virtual machine on a portable USB drive." Our friends at Ocean Systems recently announced the release of their newest product, QuickDME™ - Digital Evidence Manager. According to Ocean Systems, "QuickDME™ is a secure end-to-end digital media evidence asset manager that is easy to integrate within or between Law Enforcement Agencies allowing them to streamline the (1) ingesting, (2) cataloging, (3) dissemination and (4) tracking of all their digital assets involved in a case." This is an interesting move for Ocean Systems. This un-sourced quote from their page tells you a lot about this new product, "I’ve used the previous version named Downloader for years, so I was very pleased to learn that Ocean Systems acquired this product and did a major rewrite to now support Windows 7 while also expanding the features, speed and security options." Asset management is a crowded space. For those with an existing solution, it's going to take a lot to pry them away from their existing provider. The pricing / licensing seems to indicate that Ocean Systems' is targeting the smaller agencies with this offering. Here's wishing them all the best with this latest acquisition. This morning, Amped Software added their two cents on the issue of proprietary video formats. Check out their blog by clicking here. In other news ... there's rumors of a Basic FIVE class and a Basic Authenticate class coming to Los Angeles in August. Stay tuned. Mobile phones as a retrieval tool? Firstly, let me state completely and unequivocally, that mobile phones are NOT dCCTV retrieval tools. Secondly, let me say that using your mobile phone to record the screen of a DVR is not a good idea and the resulting file is not "the best evidence." In fact, your mobile phone footage is new evidence ... and might just be evidence of the misconduct of not properly securing the dCCTV evidence. Rarely will you have so little time left before the DVR will cycle and thus erase your evidence. If the DVR offers no digital output options (rare event), you have other worst case options like connecting to an Ocean Systems Field Kit or seizing the DVR and processing the output in your editor. Or ... you can call and ask the help of a nearby agency with the tools/tech to help. We should have as our goal the preservation of the actual evidence - the data that is within the DVR - using a method that preserves its integrity. Any other method, one that doesn't preserve the evidence intact, is problematic at best. From a Content Analysis standpoint, this information is quite valuable. I feature Content Analysis in the Intermediate FIVE class and students examine a staged accident scene. "In cooperation with the Los Angeles Police Department (LAPD), the National Insurance Crime Bureau (NICB) has produced new high definition videos showing some of the most common methods of staging motor vehicle accidents to defraud insurance companies. Staged accidents are usually conducted by organized groups that target drivers and vehicles that are likely to be insured. The organizers frequently recruit participants who receive a cash payment to join in the scheme and to claim they were injured in the crash. The organizers frequently recruit participants who receive a cash payment to join in the scheme and to claim they were injured in the crash. The organizers then have the medical providers who are in on the scheme bill the auto insurance companies for medical treatments that may be unnecessary and which may or may not be completed. Los Angeles Police says they are seeing an increase in staged accidents on area freeways, where high speeds can have dangerous consequences. They are also seeing cases of people deliberately causing an accident in a car, on a bike or on foot. According to Detective Gary Guevara of the LAPD Commercial Crimes Division, they are extorting money from the targeted driver by demanding cash that they have on them, or forcing them to drive to a bank or ATM to withdraw cash to pay them. The videos were produced at the LAPD’s Emergency Vehicle Operations Center in Granada Hills, where officers receive specialized driver training." Click here for the full story and videos. Stop selling tools as such. Start selling training - and the user gets the tools at the successful completion of the training. Price it such that they're paying for both, but don't release the tools unless the training is complete. In this way, vendors will focus on making sure that their users understand what their tools can/can't/should/shouldn't do within the forensic science context. Agencies will have the ability to know what's been taught, and thus the ability to hold the user accountable for this information. In this way, we can transition from the untrained "just trying to get things done" to a climate/culture of accountability based on standards and education / training. In the latest edition of Evidence Technology Magazine (print version), there's an editorial that discusses the problems with experts in forensic science who often have no training in science or awareness of the basics of the scientific method. The author illustrates the point using the privateer working in their garage as an exemplar for shoddy practice. While the case might be made for these folks causing problems in the courts, they're easy to spot. Just ask some very specific questions - training, experience, recent case testimony, etc. Sure, they might know about computers. They might have a CIS degree. But, what training and experience do they have with DVRs? What's their procedure? Has it been validated? What tools do they use? Are they generally accepted amongst the industry's experts? Have those tools been validated? Etc. Yet, as much as the problem of bogus experts might be, there's likely a worse problem lurking under the surface - the systemic fraud of "just trying to get something done" that is regularly employed in government agencies. If it's a fraud for untrained and poorly equipped privateers to try to pass off their work as relevant and reliable, is it not also a fraud when a law enforcement agency's employee does the same thing? Is it not systemic when the agency not only permits it to occur, but encourages it through a climate and culture of "just trying to get things done." The root of this problem might just be the NYPD's CompStat program, a "data driven program" that has spread around the country. As employees rush to clear cases and pressure is exerted to "just get things done," can the public trust the stats that are generated in this environment? "... what if the data were somehow skewed? That question has emerged as one of the by-products of a survey conducted by two criminologists that has raised doubts about the integrity of the New York Police Department’s highly regarded crime tracking program, CompStat. Relying on the anonymous responses of hundreds of retired high-ranking police officials, the survey found that tremendous pressure to reduce crime, year after year, prompted some supervisors and precinct commanders to distort crime statistics." So as I work away at eventually receiving a PhD, and sit through seemingly endless lectures on reliability and validity in dealing with statistics, there is (quite sadly) a gaping hole in the CompStat media campaign - validity and reliability studies from independent researchers. From what I've read on the issue, there's a huge co-mingling of causation / correlation narratives, but not a lot of reliable data supporting CompStat as valid and reliable. Thus, if there's a pressure to perform, might there be a pressure to "just get something done" in the lab? Do you honestly think that if a whole agency is skewing the CompStat books - that pressure to cook the books does not exist in the lab? If they are skewing the data (and thus the results), is this any worse, or better, than the privateer in the Evidence Technology Magazine article? If government employees are ignoring the scientific method, using unproven/unvalidated tools and techniques, working outside of their scope of expertise, I would argue that it's worse, far worse. Yesterday, I had a ton of footage submitted with the request to blur all faces of the people in the videos. The videos were from a variety of surveillance sources; shaky pole cams, static cams, and hand-held cams. Each of the videos had multiple people moving around. So, I had my work cut out for me. Thankfully, I can do this easily in FIVE. Using the Hide Selection filter, you have many options for blurring regions of an image. Because of the multiple movement dimensions of each subject, I chose to use Manual Tracking. Then, I set up the blur for each person. Working one at a time, you can blur each face independently by simply using multiple instances of the Hide Selection filter. Because you're writing text instructions to the display and not actually rendering new pixels, the process is fast. The rendering happens when you write the final (new) file. Best of all, if you need a report of what you've done, with FIVE, the steps are all recorded for you. The mask's coordinates, frame numbers, etc. are all on the report. For me, one 4 minute clip with five subjects all moving independently, and with the camera shaking ... the report was 35 pages long. But, it's all there and I didn't have to handwrite the report. Yesterday, Larry Compton wrote an excellent piece on the caution necessary when converting proprietary files. This topic is on everyone's mind. To add my two cents to the conversation, I'm seeing more proprietary file types than standard these days. Thus, the amount of time spent researching the player, the codec, the container, the contents ... testing the player/file playback ... verifying frame counts, looking at the GOP, verifying, testing, re-testing ... and so on ... is rather burdensome. If you're not checking and re-checking, testing and re-testing, you may be open for a challenge later on. Sometimes, FFmpeg moves so fast, you miss those vital cues that something's amiss. As Larry points out, if you see red or yellow text, you've got issues worthy of investigation. Because FIVE uses FFmpeg, I'm always worried that the basic user will accept at face value what is created through the Load filter when using the Change/Convert tools. DON'T!!! You're an analyst. Test. Re-test. Verify. Sure, FIVE is easy and fast. But, nothing is perfect ... especially when dealing with some of the most dodgy evidence known to the justice system - proprietary digital CCTV files. If the converted file has a different frame count than the original, the conversion didn't work correctly. If your converted file's I Frames aren't in the same place as they were in the original file ... etc. With FIVE's support, you can bring these issues up to the developers. I may send them a few clips per week for further analysis of the conversion issues that come up. Moral of the story ... check your work, test your theories, verify your tools. "Motivated reasoning is confirmation bias taken to the next level. Motivated reasoning leads people to confirm what they already believe, while ignoring contrary data. But it also drives people to develop elaborate rationalizations to justify holding beliefs that logic and evidence have shown to be wrong. Motivated reasoning responds defensively to contrary evidence, actively discrediting such evidence or its source without logical or evidentiary justification. Clearly, motivated reasoning is emotion driven. It seems to be assumed by social scientists that motivated reasoning is driven by a desire to avoid cognitive dissonance. Self-delusion, in other words, feels good, and that's what motivates people to vehemently defend obvious falsehoods." "Dave Glover from our partner, GP Sift, will be at the MediaSolv booth #2407 showing the new workflow for converting and viewing proprietary video files in the latest version of Amped Five. If you're in Washington D.C., come by and see it! GP Sift, MediaSolv, and Amped Software have developed an integrated workflow for homeland security specialists, investigators, intelligence analysts, and digital media forensic experts to provide the most effective solution in the industry. Proprietary video files from surveillance systems are the most common source of problems for video analysts. Amped Five now provides some new updated tools to help this process become very fast and easy." The GovSec/TREXPO 2014 to be held May 13-14, 2014 at the Walter E. Washington Convention Center, Washington DC. To find out more, visit Dave Glover in Booth #2407. "If you happen to follow some forensic video analyst mailing lists, forums, and LinkedIn groups, you know that usually 9 out of 10 threads are variations on the theme “Who has the player (or codecs) for the XYZ format?”. There are thousands of different proprietary video formats on the market, but most of them are not fully proprietary and employ standard codecs in a proprietary container. About a year and half ago we introduced the possibility to convert some proprietary formats in Amped FIVE. When we tested that technology then, it working on around 20-25% of the formats we came across. Not a great percentage, but something is usually better than nothing. With today’s release of Amped FIVE , we are expanding the compatibility to more than 70% of the formats we have in our database. As we cannot certainly have a sample of all the formats on the market, we expect that the user success percentage will be a bit lower, but should not be that much. Now instead of “something is better than nothing”, you have a fighting chance with conversion. If you have issues with a specific format, it is very likely that we are able to support it, if you can provide us with samples. Don’t hesitate to contact us with format support requests. To use the new conversion tools, you just need to go to File > DVR Change Container To AVI." Click here to continue reading about this exciting news on Amped's blog. I just returned from Ft. Worth, Tx, where I presented a 40 hour course on Intermediate Forensic Multimedia Analysis with Amped FIVE Professional (many thanks again to the wonderful folks at the Tarrant County DA's office). Whilst there, I got a peek behind the scenes at an exciting new development - the integration of MediaSolv, GPSift, and Amped FIVE. There's an announcement from them coming soon. But, suffice it to say, it's awesome. It solves a ton of problems. It's going to make things in Texas go a lot smoother. Remember, easy things should be east, and fast. Difficult things should be easy and fast as well. With this new partnership, your workflow is about to get a whole lot easier.